If you’re a seasoned poker player you may be familiar with different variants of the game. There is one though you may have heard of but you’re not sure what it is. It has a refreshing fruity name, guaranteed to get your juices flowing! Pineapple Poker is a variant of the traditional Texas Hold ’em game. If you’re familiar with Texas Hold ’em you’ll have no problem learning the Pineapple Poker rules. It does take skill however, so give yourself time to practice and learn the game before playing for money. The main difference between Pineapple Poker and Texas Hold ’em is the number of hole cards you’re dealt. You’re given 2 hole cards in Texas Hold ’em compared to 3 hole cards with Pineapple Poker. This means there are many more hand possibilities in Pineapple Poker making it more exciting. As well as getting a third hole card you also get the opportunity to discard one of the cards dealt at the beginning of the bets. You’ll enjoy the thrill of this action packed game with bigger pots and greater payouts! Though it’s typically played as a limit game, many times it’s played with a no limit pot structure. There are several Pineapple Poker variants but the rules remain similar. One thing is for sure, you’ll never get bored in a game of Pineapple Poker as it’s so fast moving! 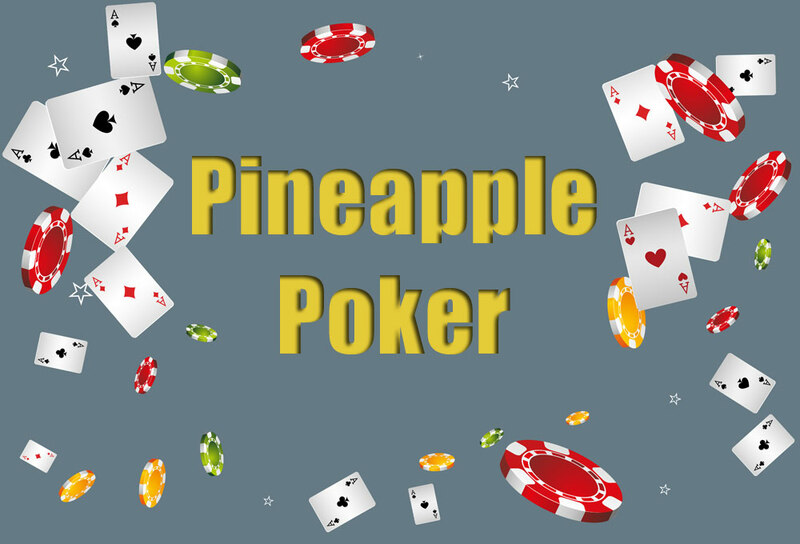 Pineapple Poker rules are fairly easy to understand and once you get the hang of it you’ll have great fun playing and enjoy the fast paced thrill of the game. The dealer is chosen from all players after shuffling the cards. The one with the highest card gets to be the dealer. The player who sits on the left hand side of the dealer places a forced bet. Then the player to the left of him places a bet that’s double the amount. So if the largest bet was 10, the smallest bet would be 5. If a no limit game is being played the bets are usually a percentage of the maximum buy in. The player who placed the biggest forced bet begins the first round. This continues clockwise around the table. The initial round of bets is fixed at the lower limit with players allowed a maximum of four each. The dealer shows 3 shared or community cards face up. After the first round of bets has finished each player has to discard one hole card. The second round of bets continues with each player discarding a hole card. This round is once again set at a lower limit. Afterwards, the dealer shows another community card face up which is known as the turn card. The third round of bets is set at a higher limit. Then after the next round of bets the third community card is shown which is known as the river. In pineapple poker the last round of bets is known as the showdown, and in this round bets are set at the highest limit. The winner is the player with the best five card hand. There are several Pineapple Poker variants, one of the most popular being Crazy Pineapple. Enjoy the crazy high action drama in this version of Pineapple. The main difference between Pineapple and Crazy Pineapple is that a hole card in Pineapple Poker must be mucked prior to the initial round of betting. In Lazy Pineapple players keep all three cards throughout the entire hand. In this variation of the game the rule still applies that you can only use up to two hole cards to make the five card hand. Super Hold ’em is another variation in which Pineapple Poker rules are almost identical. In Super Hold ’em though, all three cards can be used in making the final hand. Online poker is a fun and entertaining way to spend your free time. It’s a skill that can be developed by practice and is one of the most popular casino games online. Online poker allows you to play from the comfort of your own home, and pineapple poker is sure to keep you on the edge of your seat as you place your bets! The good thing about the growing popularity of the game is there are more players online. This results in higher prize pools and greater payouts. ← Is counting cards in poker as easy as it seems and how do you do it?